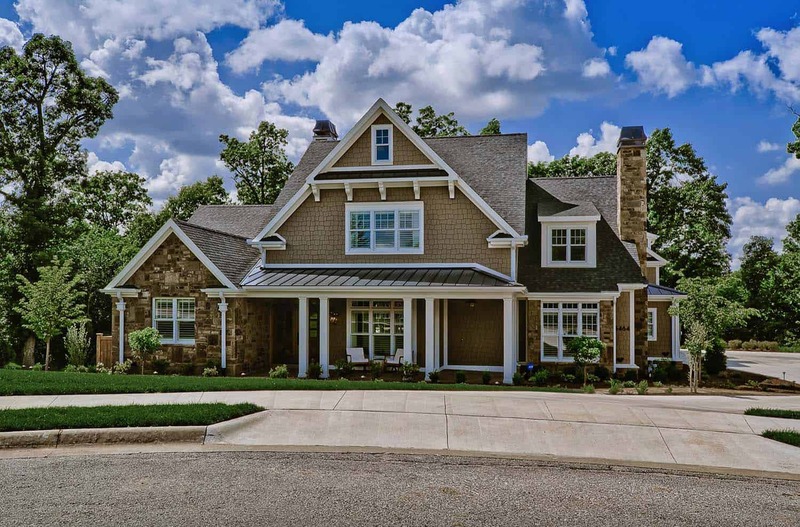 This beautiful craftsman style home was designed by Celtic Custom Homes, located on a sloping property in Fayetteville, Arkansas. 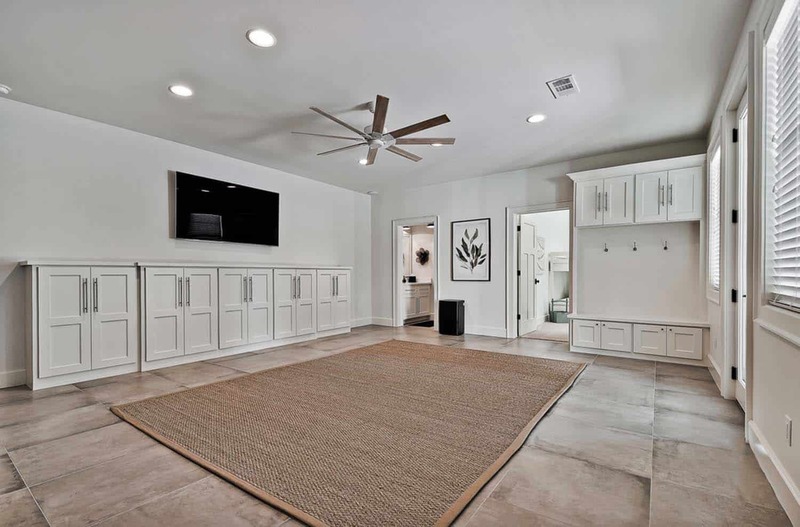 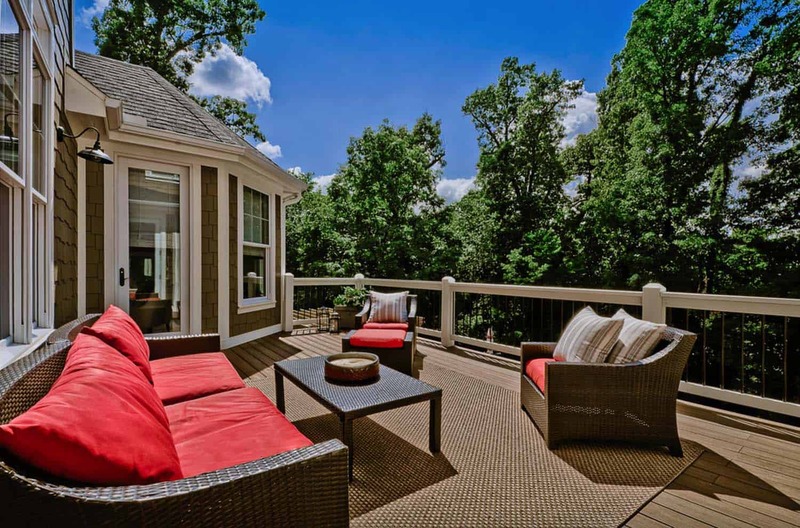 The residence ideally backs up to the Blessings Golf Course in Clear Creek. 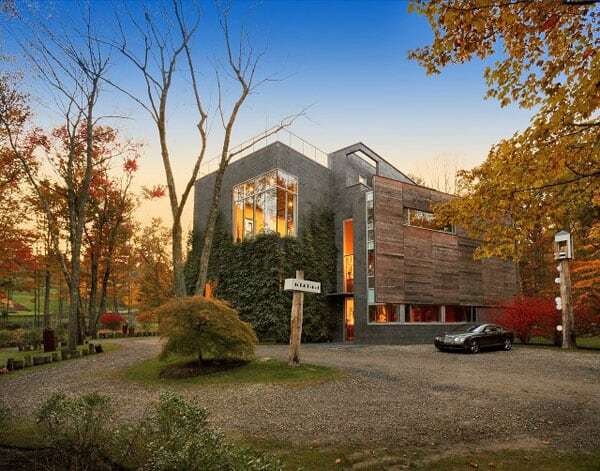 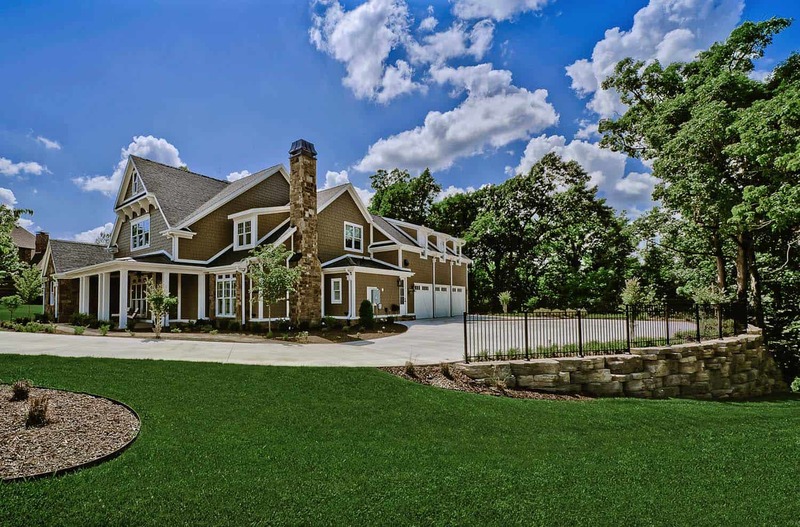 Spread out over three levels, this 6,700 square foot home encompasses five bedrooms and five full bathrooms with two half baths. 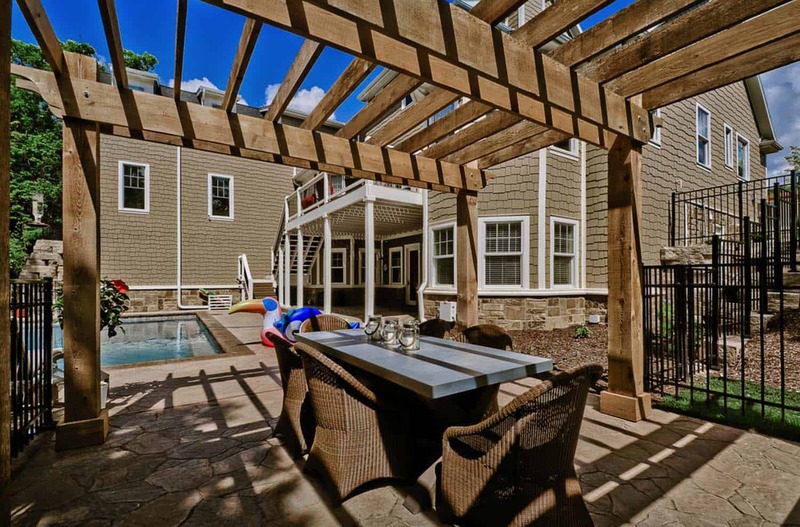 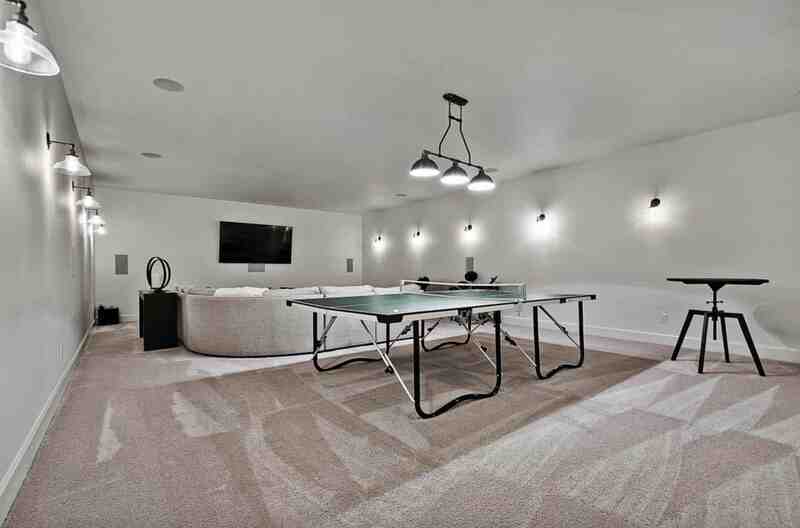 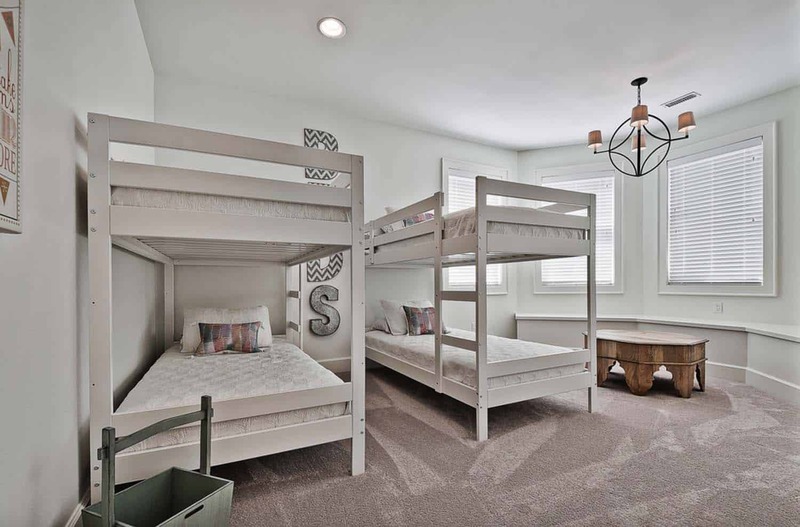 Highlights to this property includes a home theater room, craft room, two laundry facilities, a man cave and a walk-out basement that leads to an outdoor kitchen and swimming pool. 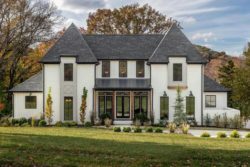 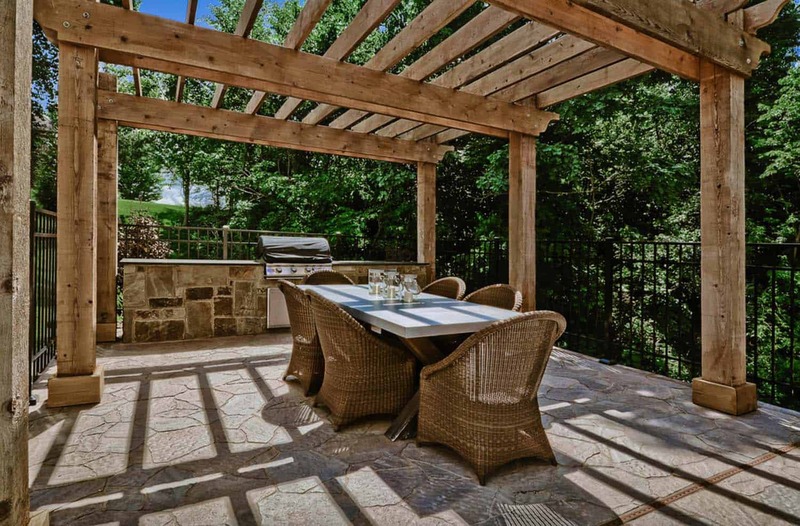 Interesting Fact: This home was featured in the Northwest Arkansas Parade of Homes for 2018. 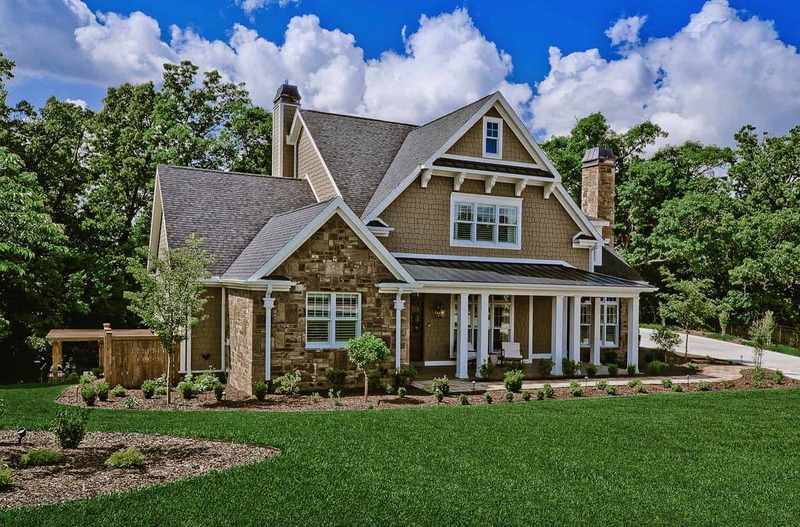 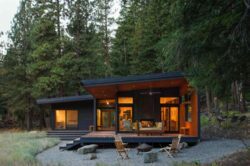 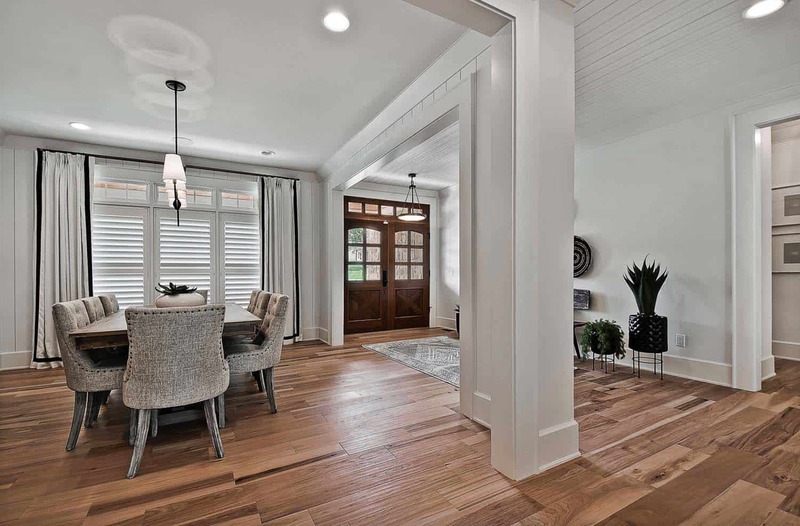 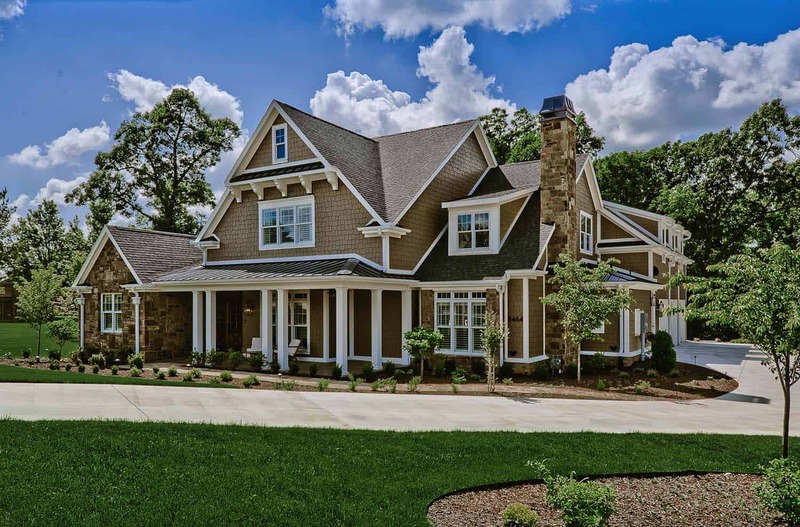 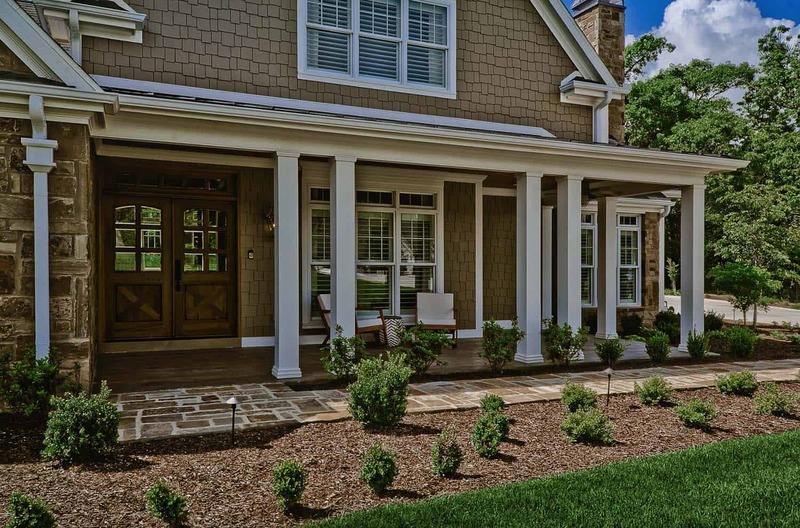 What We Love: This craftsman style home features a warm and welcoming exterior facade that invites guests to want to explore what is beyond the front door. 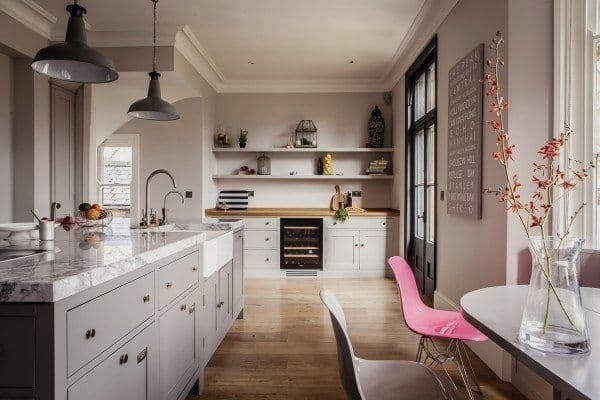 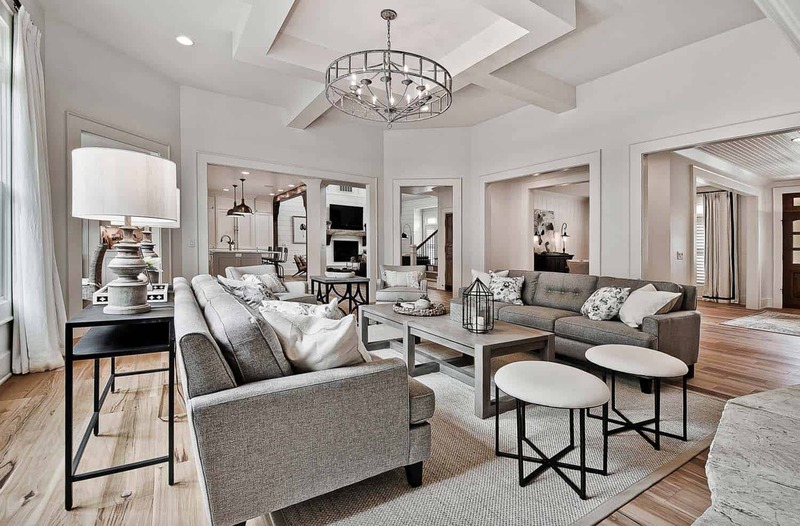 Inside, a bright and airy interior layout is bursting with design inspiration around every corner. 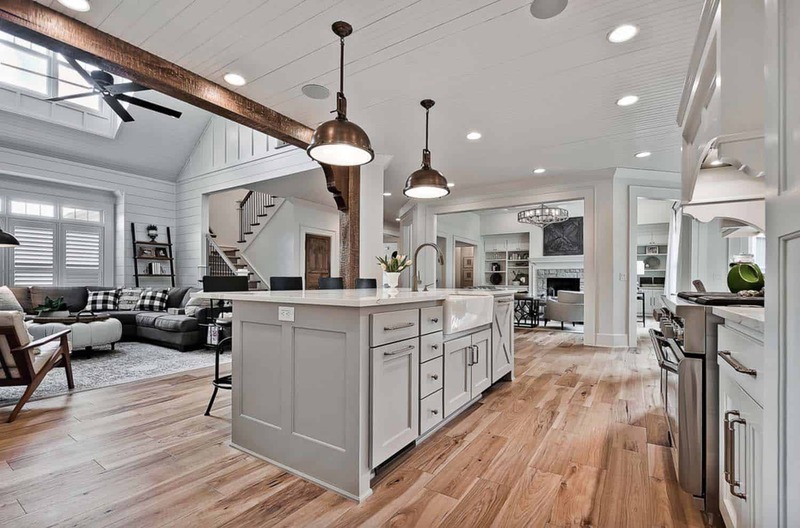 We are just loving the farmhouse style elements infused into the decor, adding a very livable feel to the overall design. 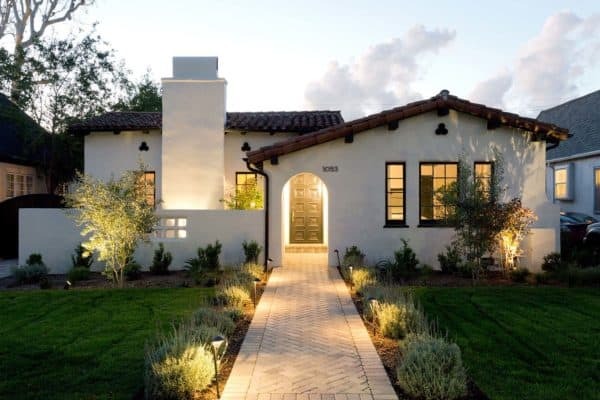 We here on One Kindesign love reading your feedback, so please tell us what you think of the overall design of this project in the Comments below! 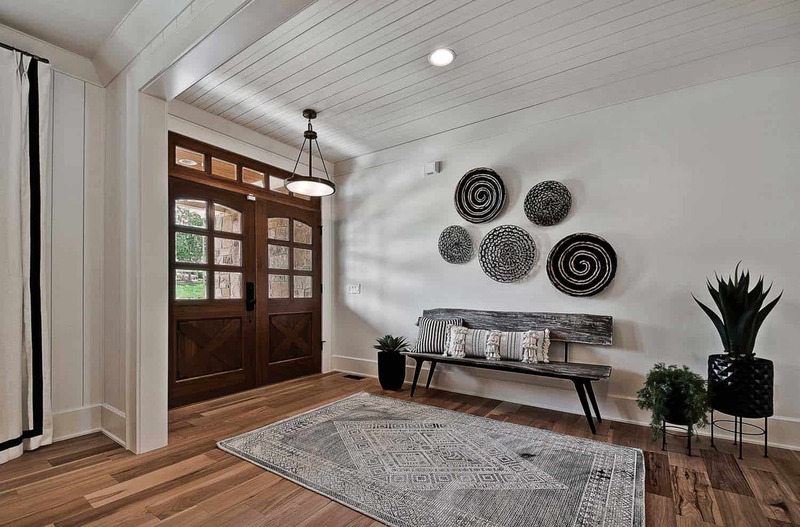 Above: The front entryway door was sourced from Encore Flooring and More in Springdale, Arkansas. 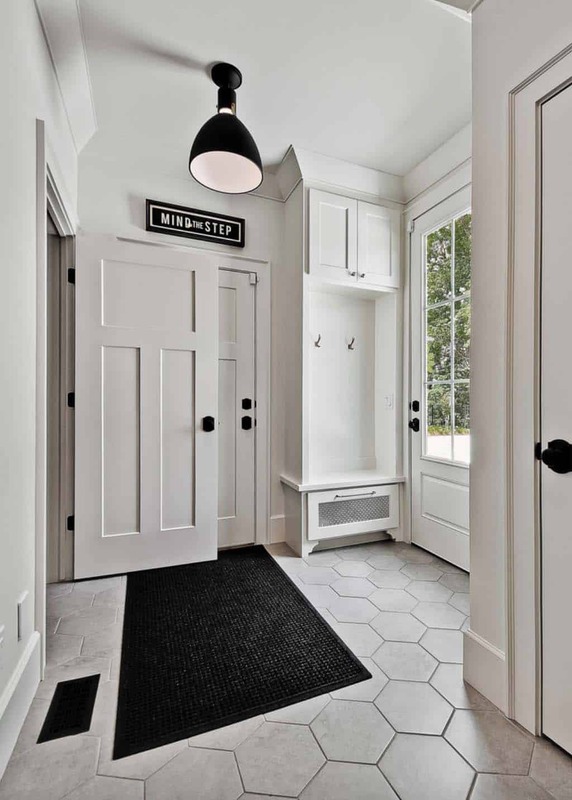 It was manufactured from GlassCraft Doors. 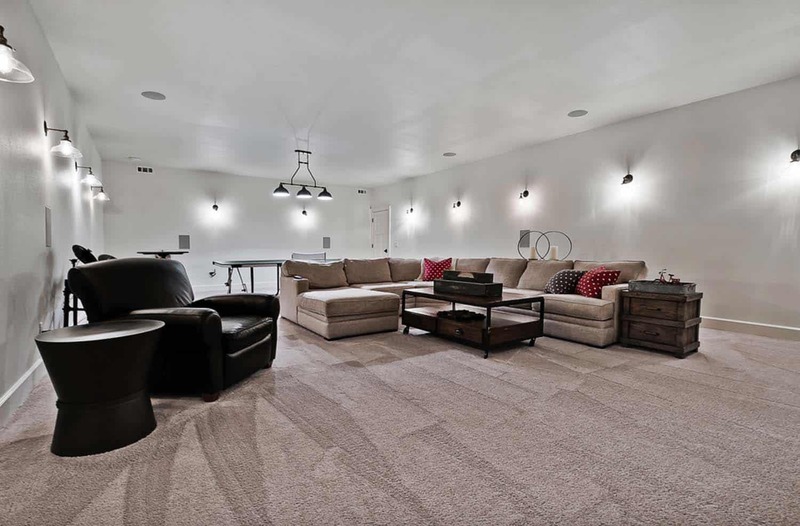 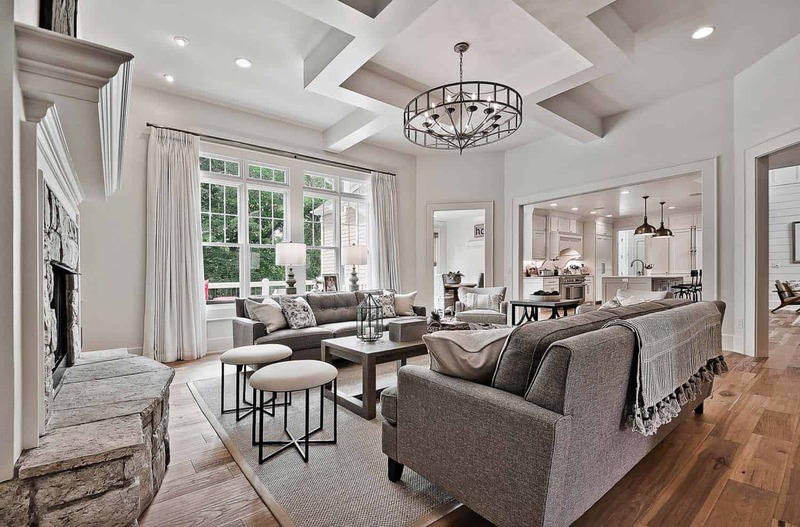 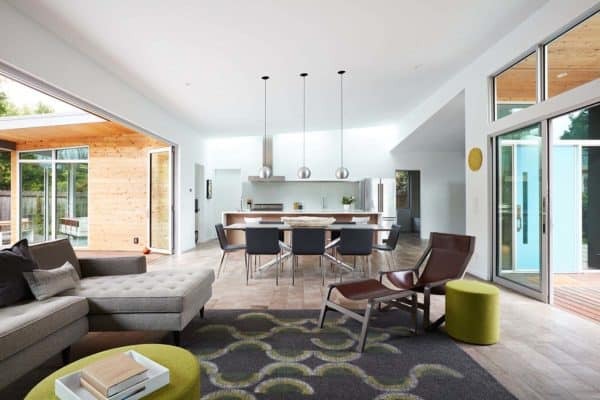 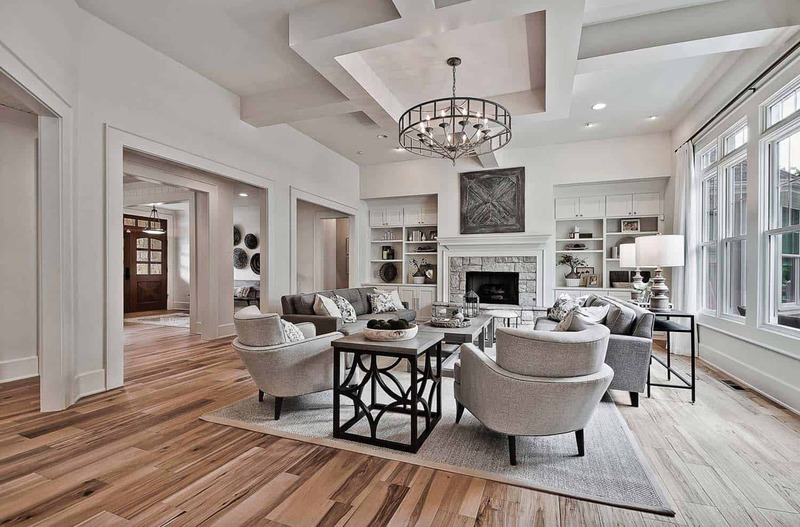 Katie Grace Designs was the interior designer responsible for the beautiful interior living spaces of this project. 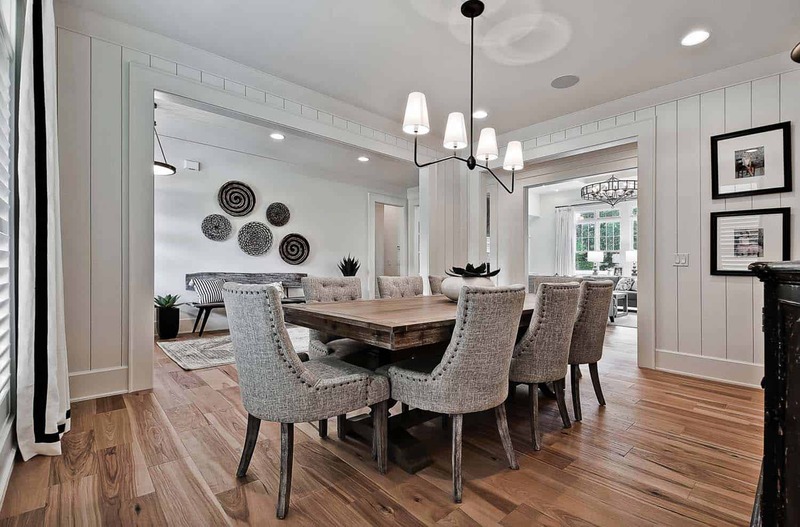 We have featured this interior designer’s work on another home tour here: Decorated for the holidays: Freshly renovated home in Little Rock. 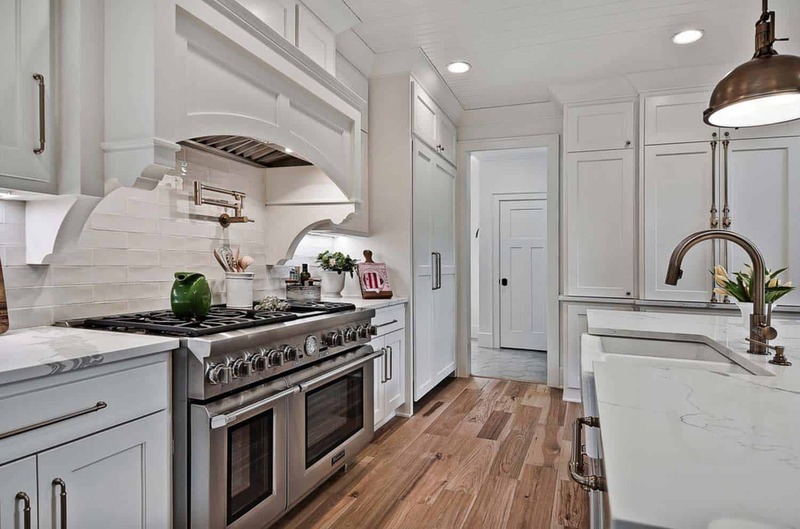 Above: The walls, trim and cabinets throughout are painted in White Dove OC-17 | Benjamin Moore. 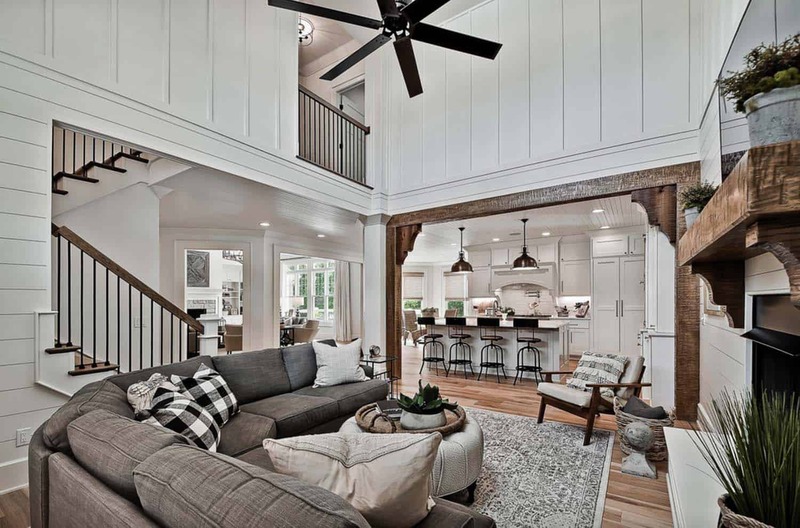 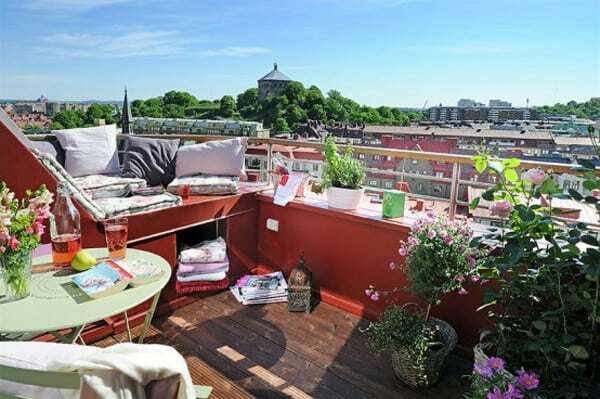 Above: The Living room is 20′ 8 1/2″ long and 19′ 3 1/2″ wide. 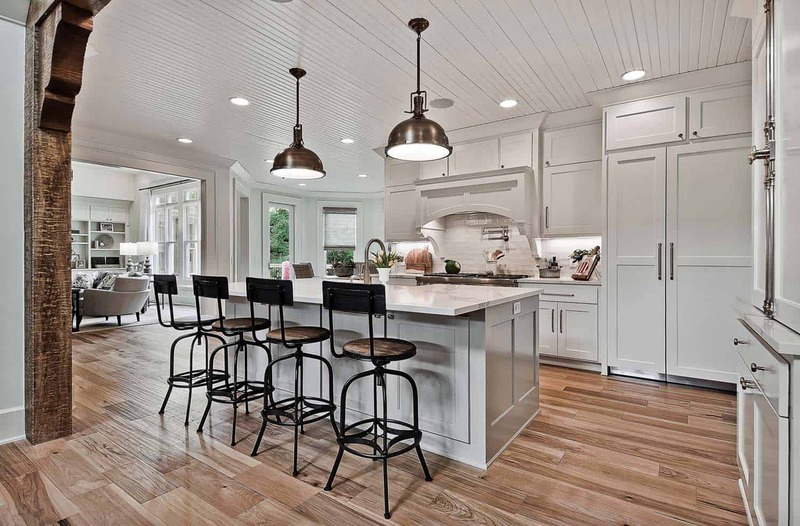 Above: The kitchen island is painted in Colonnade Gray SW 7641 – Sherwin Williams, whereas the cabinets, walls, trim, and ceiling is White Dove OC-17 | Benjamin Moore. 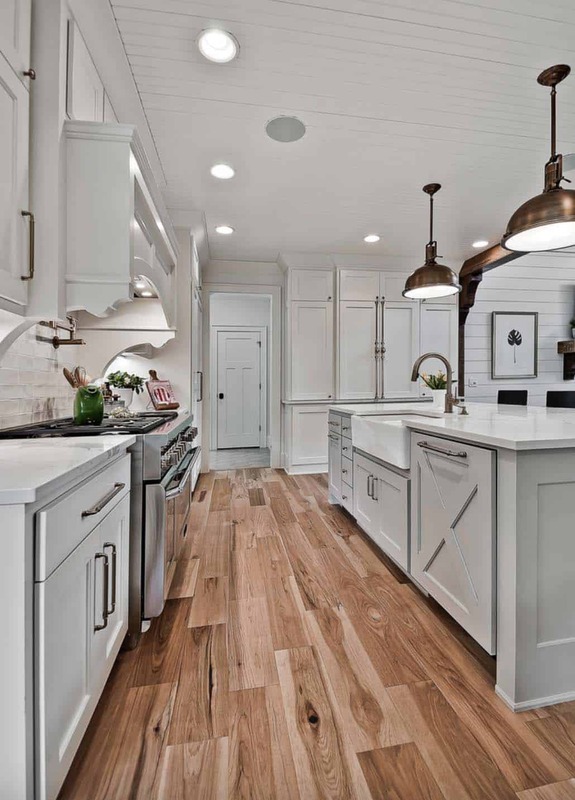 The countertops are quartz from National Marble and Granite in Springdale, Arkansas. 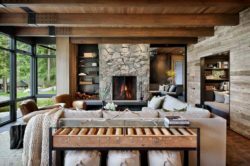 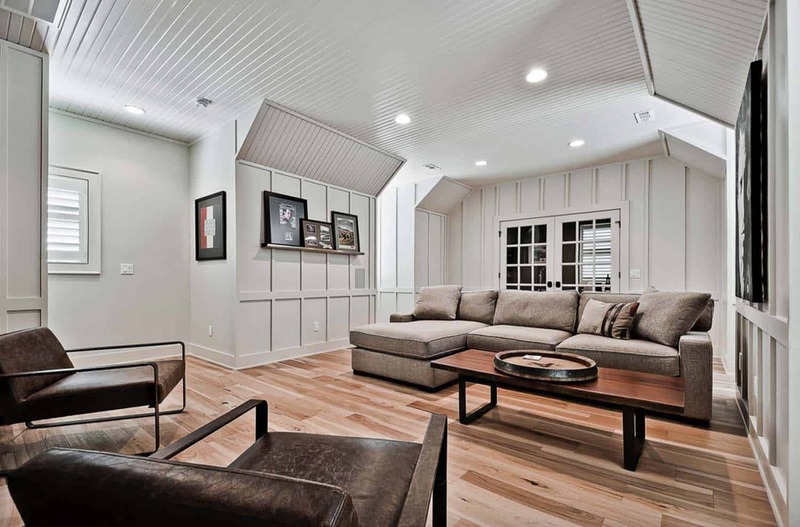 Above: The farmhouse style family room features custom fabricated ceiling beams and fireplace mantle, built on-site. 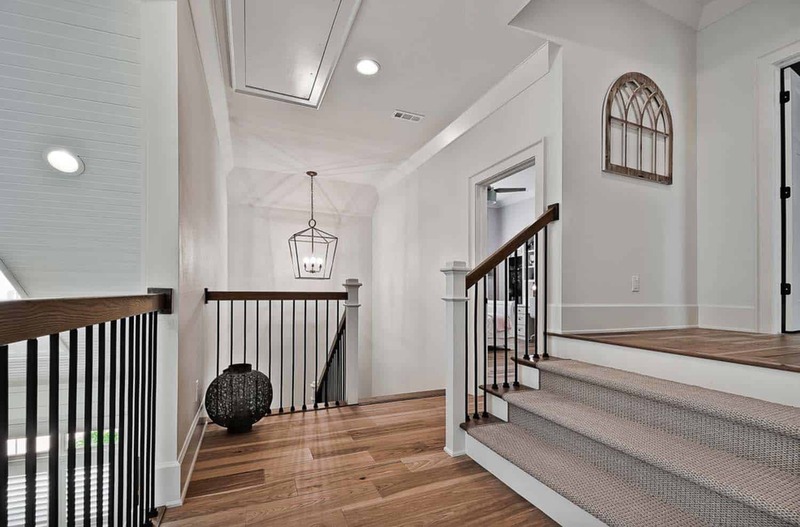 They are hollow except for the corbels. 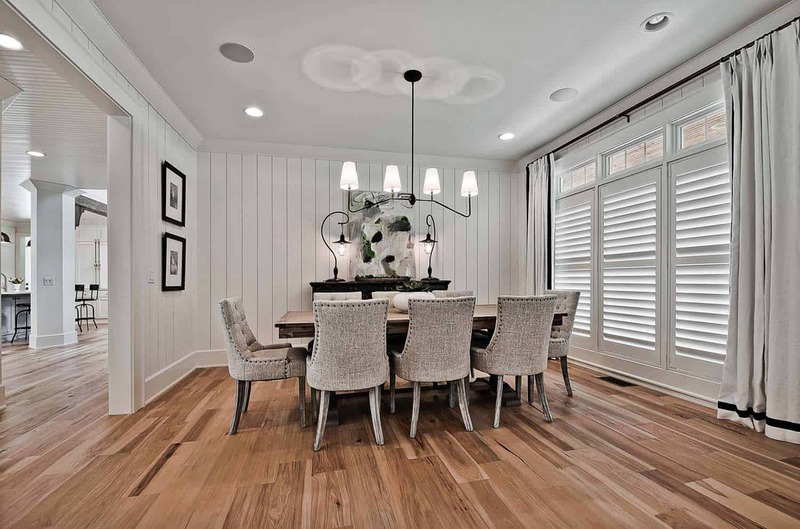 The wood was ran through a router to give them the rough-hewn look. 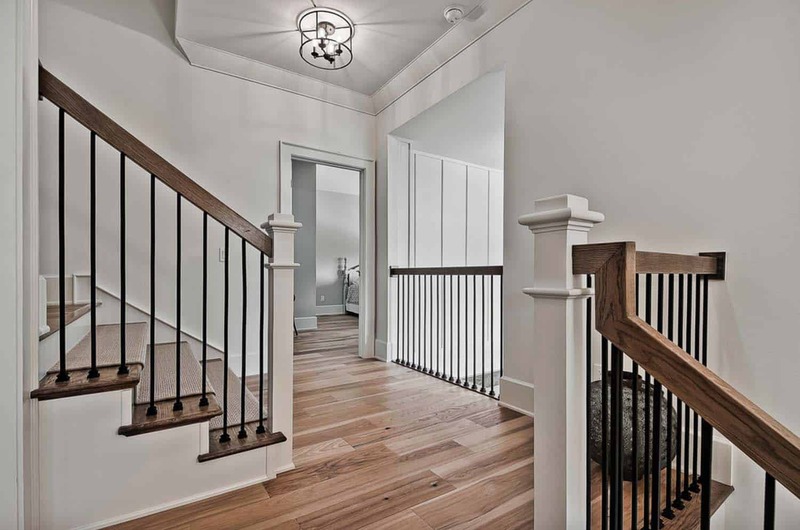 The paint color is White Dove OC-17 | Benjamin Moore. 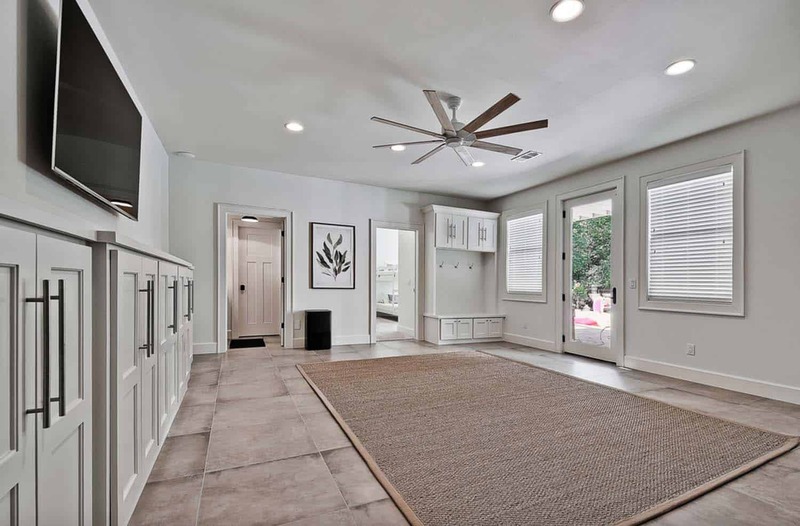 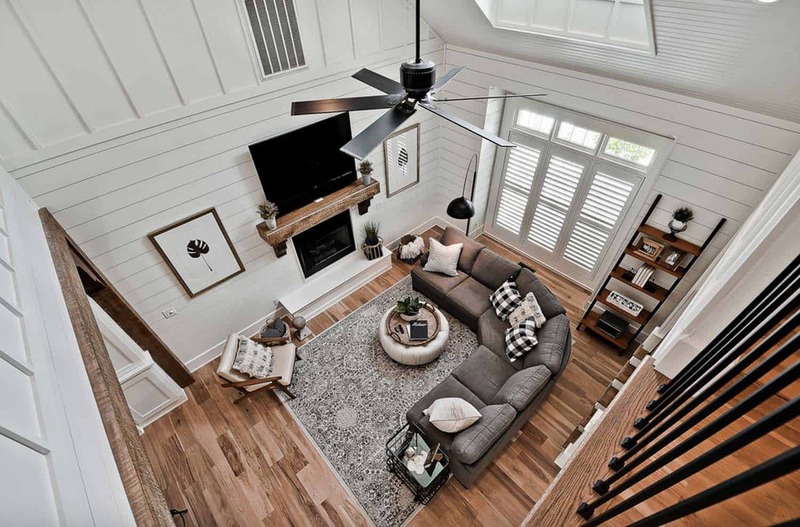 Above: The ceiling fan came from Lighting Emporium in Springdale, Arkansas. 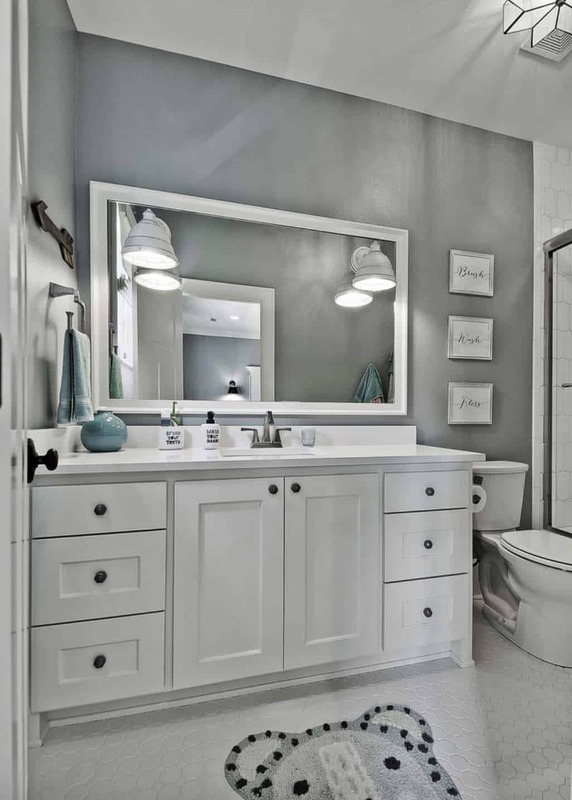 Above: The bathroom vanity countertop is a quartz, called “Fiji” white. 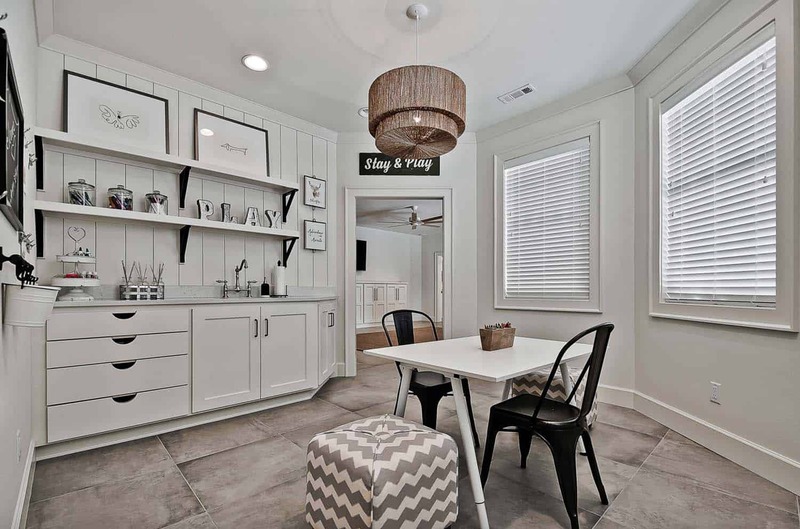 Above: The floor tile in the laundry room is Lungarno Lyon G4538 Hex, sourced from Encore Flooring and More in Springdale, Arkansas. 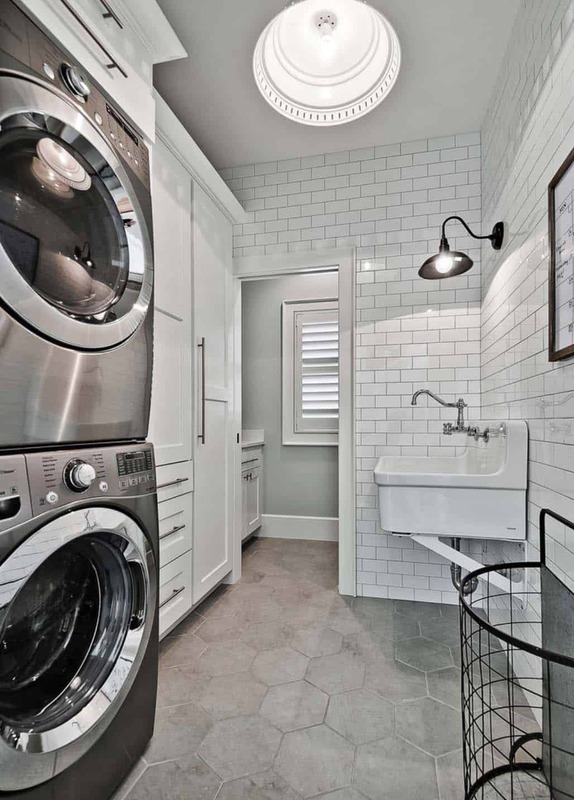 Above: The faucet above the sink was sourced from Delta. 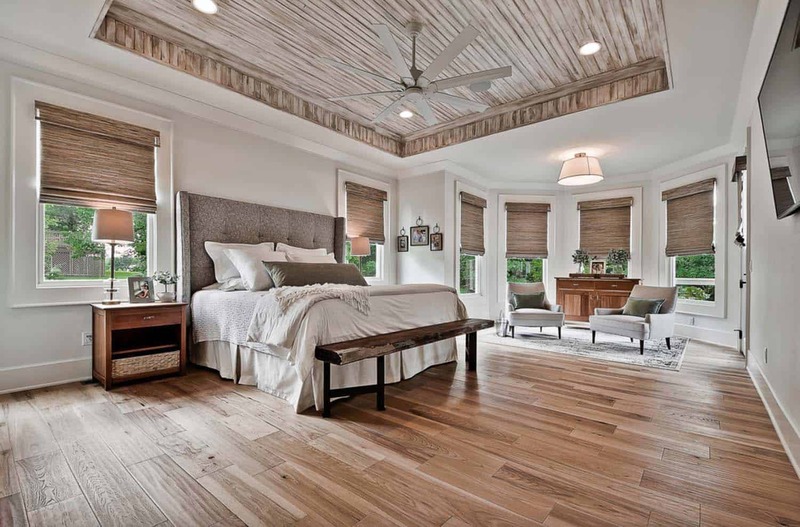 Above: The master bedroom dimensions: the main area is 16’x16′ and the sitting area is approximately 6’x13′. 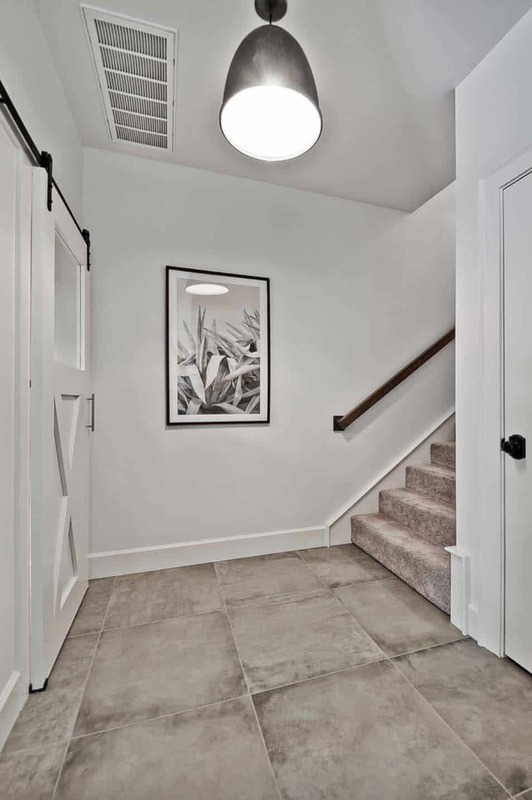 The walls are painted in White Dove OC-17 | Benjamin Moore. 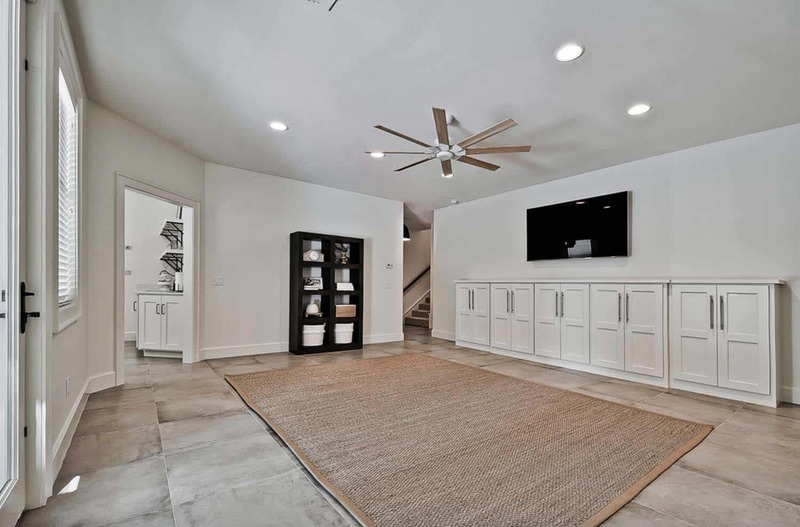 Above: The porcelain tile on the floor is Shaw Valentino Action 100, sourced from Encore Flooring and More in Springdale Arkansas. 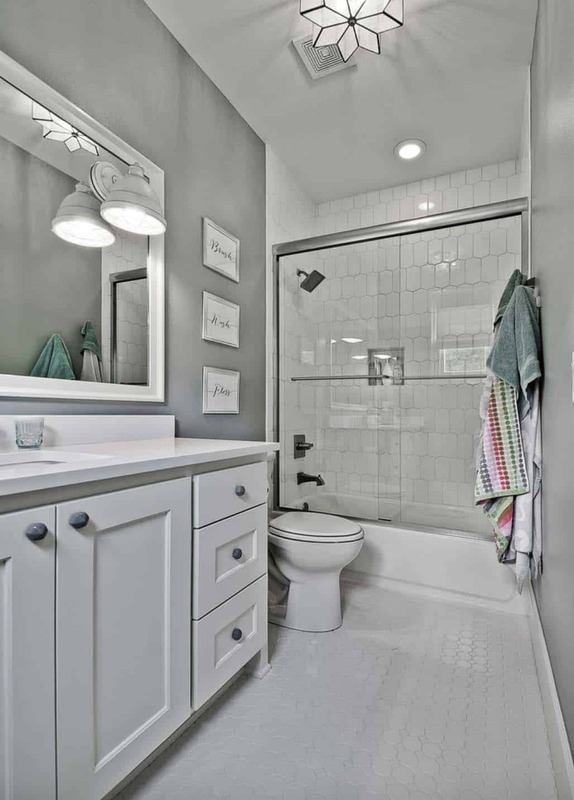 Above: The grout color in the shower is “bleached wood”. 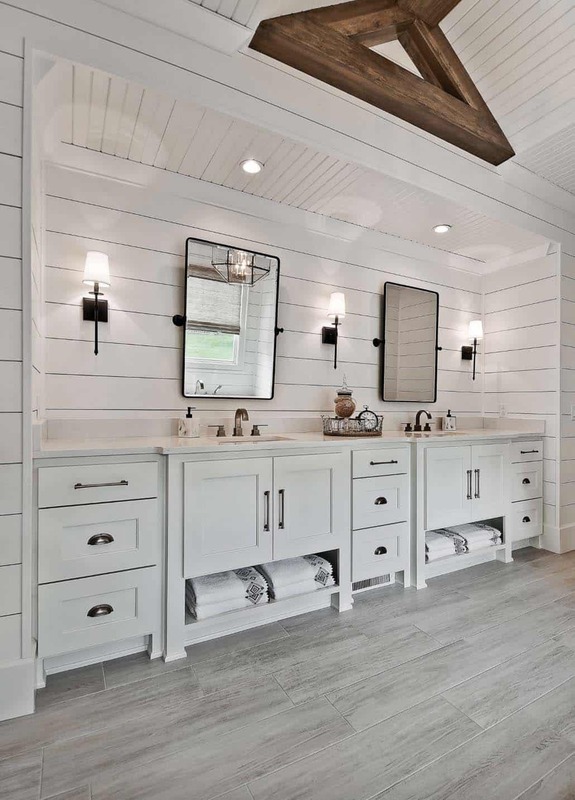 Above: The bathroom walls are white pine shiplap from Quality Millwork in Bethel Heights, Arkansas. 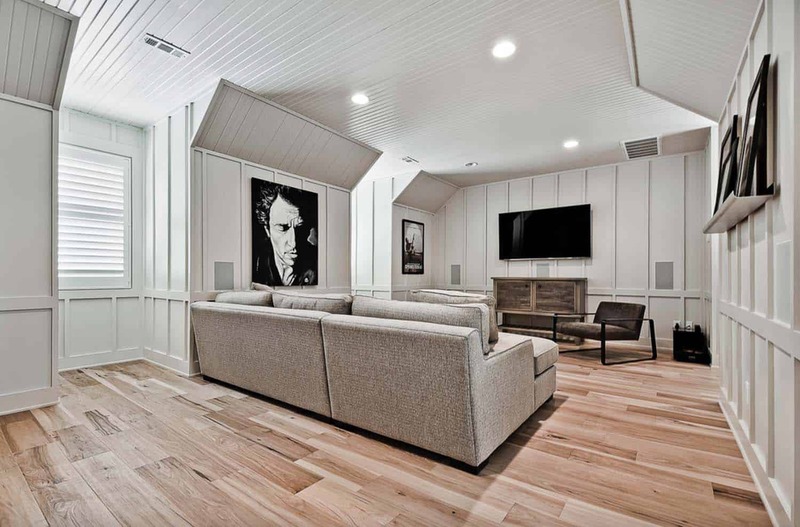 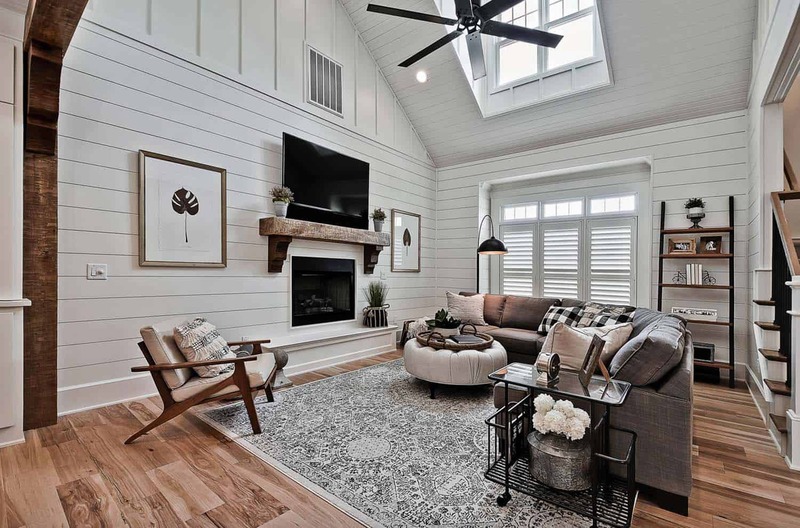 Shiplap is a 1×8. 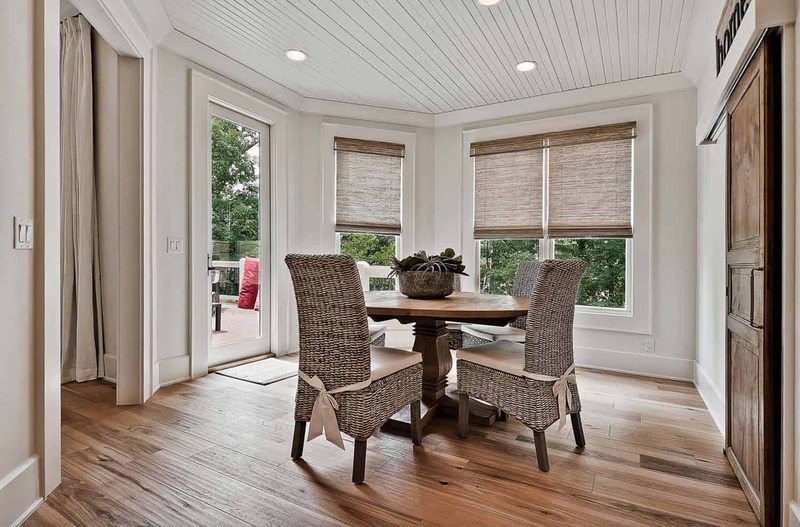 To transition, corner trim was used on the outside corners, and cove trim on the inside corners. 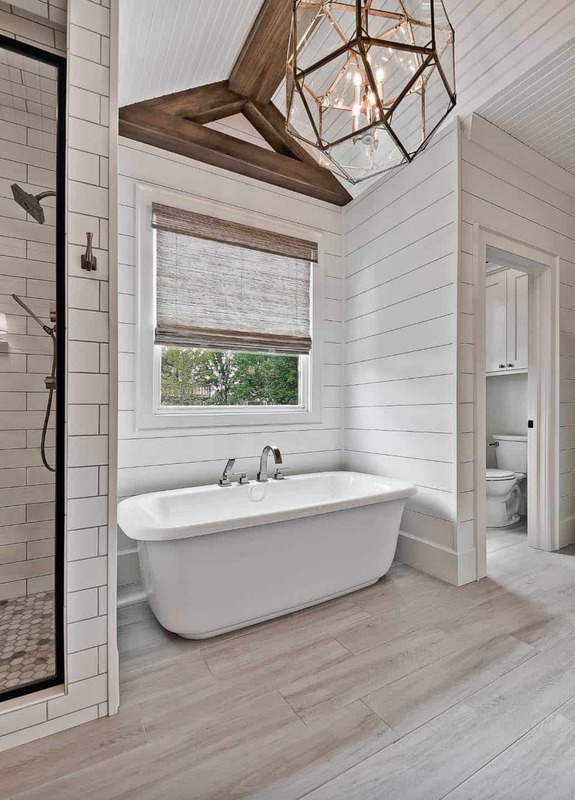 The soaking tub is from Andersons Supply House in Springdale, Arkansas, while the chandelier overhead is from Joss and Main. 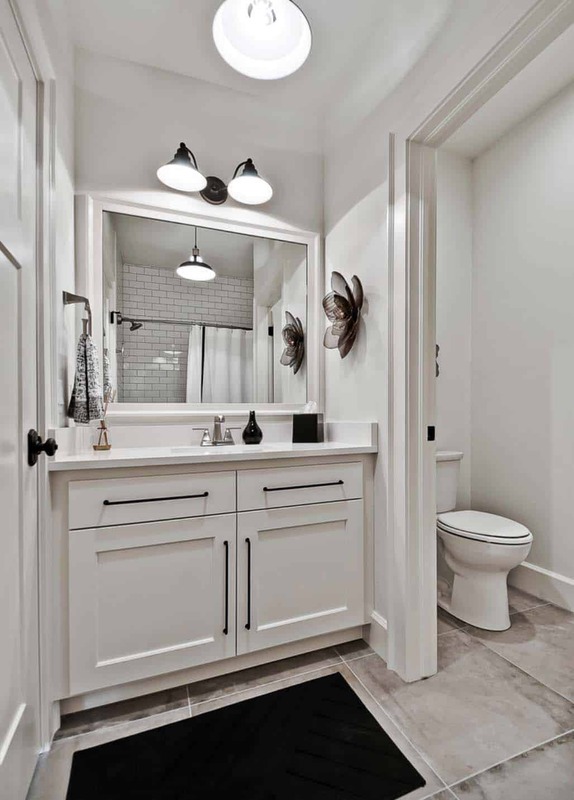 Above: The mirrors and sconces are from Restoration Hardware online, while the sink faucets are from Delta. 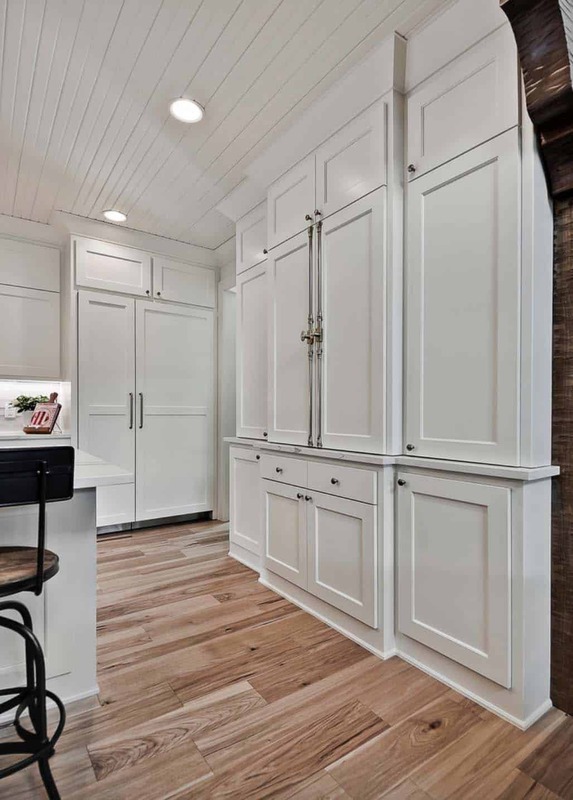 The shiplap walls are white pine, which is primed and painted in White Dove OC-17 | Benjamin Moore. 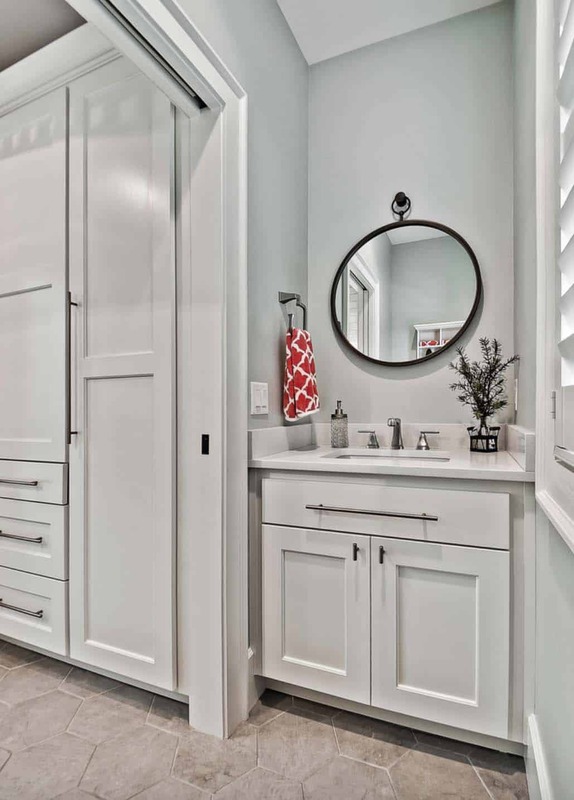 This bathroom vanity, and all of the cabinetry throughout this home, was custom-made by Verser Cabinet Shop in Rogers, Arkansas. 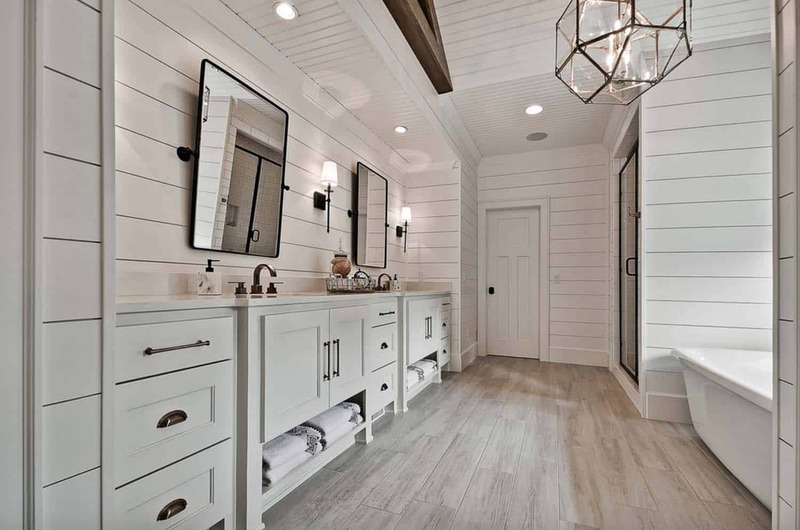 The vanity dimensions are: 137 1/4″L, 22″ D and 36″ H.
Above: This powder bathroom nods to farmhouse style with its painted white pine shiplap walls, traditional wood vanity and a rounded mirror. 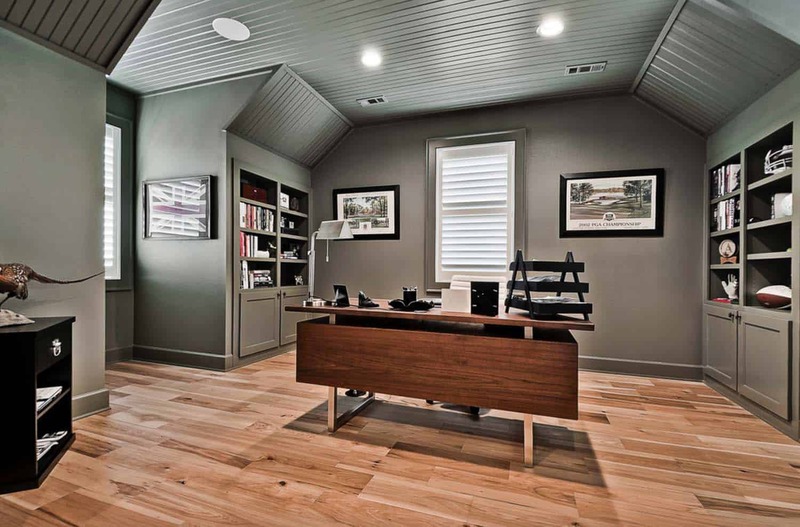 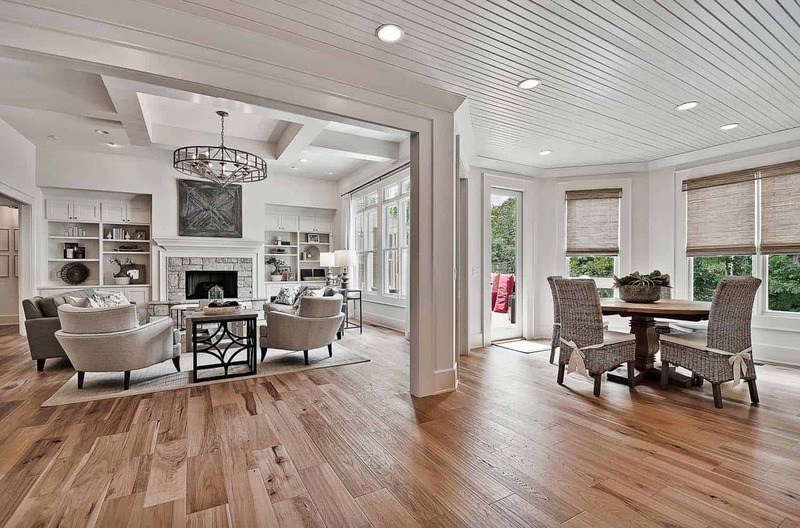 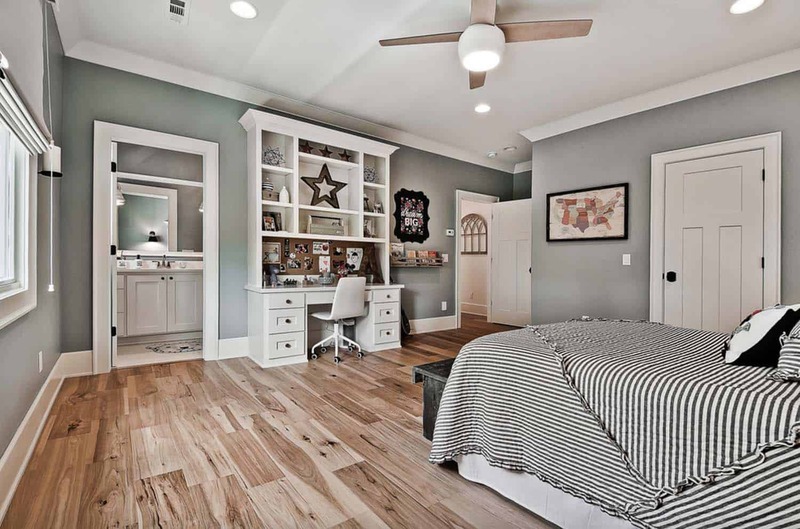 The white pine shiplap walls are painted in Retreat SW 6207 – Sherwin-Williams at 200%. 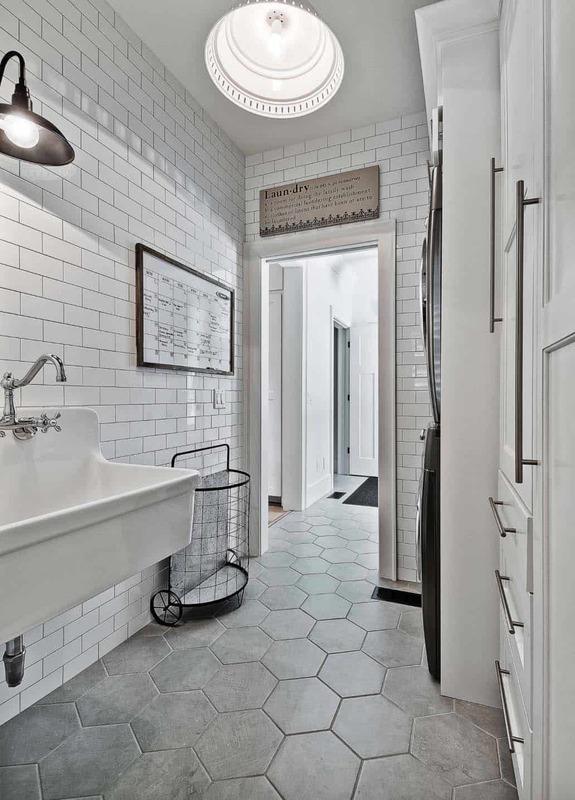 The patterned floor tiles are from The Cement Tile Shop. 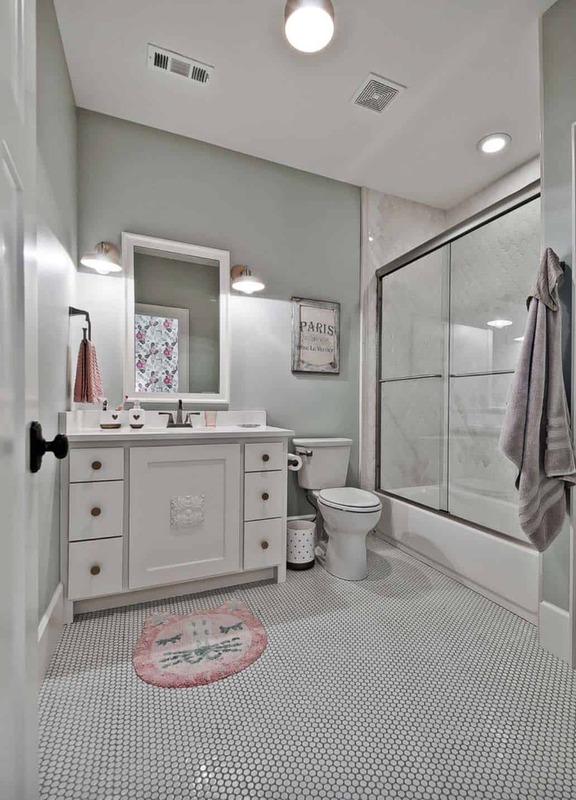 Half bathroom dimensions are: 5′ 5″ x 6′. 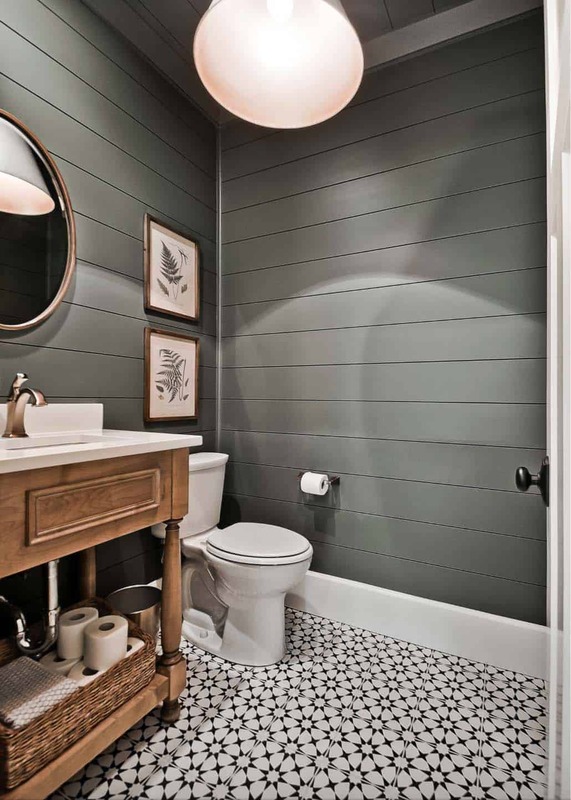 Above: The bathroom walls are painted in Sea Salt SW 6204 – Sherwin-Williams.